SportingBet may not be the biggest player in the betting world, but they have produced a very suitable betting app which firmly puts them on the mobile betting map. The company have worked hard to create a client base of over 2.5million customers around the world, with this number set to rise amidst the introduction of the SportingBet mobile betting app. One of the main selling points for the company has been providing some of the best odds in the industry. Whilst this may seem obvious, it’s actually something that seems to get left behind with many betting companies who try to pull in punters by providing other betting features and gimmicks. Upon registering a new account with SportingBet you will be eligible to claim a free bet worth up to £50 on your first deposit and bet. The bet basically works as a no lose bet. This means that if your first bet wins, you get the keep the profits and your bet, but if your first bet loses SportingBet will refund your bet up to £50. It’s worth noting that you can register your account directly from the SportingBet app. Once you have installed the app on your smartphone tablet simply click the red register button in the top right corner. Alternatively if you decide to register via your PC then you can do, whilst then being able to access the app with your login details. The app itself is available on all major smartphone devices, including iPhone, iPad, Android, Blackberry and Windows. Apple users can download the app directly from the App Store – for free – whilst other platforms will need to access SportingBet.com on their device before being taken to their betting app. We will be honest and say it’s not the best looking app on the market, but that doesn’t mean it’s ugly by any means. 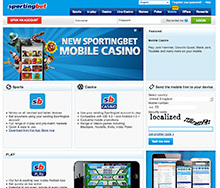 The mobile betting industry is very competitive these days and SportingBet have failed to really upgrade the aesthetics of their betting app over the last couple of years, where their competitors have. The design is a little more ‘fun’ than others on the market, with images looking as if they are meant to be more quirky than the majority. The market integration is actually very good and the amount of sports on offer is excellent. One thing we can’t really get away from in its interface is the slower loading times, especially on 3G connections. This probably has something to do with the increased number of graphics. The SportingBet betting app is fantastic place to be for anyone wanting to bet on in-play markets. Sports such as football and tennis have these markets in abundance and it’s rare to not be able to find a game to bet on, even in the wee hours. We also really enjoyed its highlights section found at the top of home screen. Being able to quickly flick between some of the bigger betting markets and even some of their on-going promotions is really handy, especially when you are often on the go with this betting app. The SportingBet betting app is far from the perfect mobile betting app. It has its flaws – the biggest being loading times – but it does excel in other areas. Their bonus offers are excellent and provide a 10% bonus on all bets made via your mobile, which would be enough reason for some bettors to switch over to SportingBet alone. The SportingBet app feels very honest, and what we mean by this is that it sort of does exactly what it says in the tin – bet on sport. The market coverage is good, the number of sports is up there with the best and the layout of the app functions really well. There are a few niggles in this app, no doubt, but on the whole this is more than capable betting app and will suit the needs of the majority of mobile bettors. Visit Sportingbet – £50 Completely Free Mobile Bet!